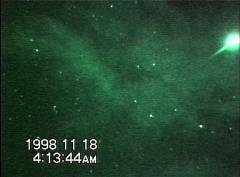 Report of The Leonids 1998 in Japan. We tried to observe the meteor shower of Leonids at Nov.17-18. 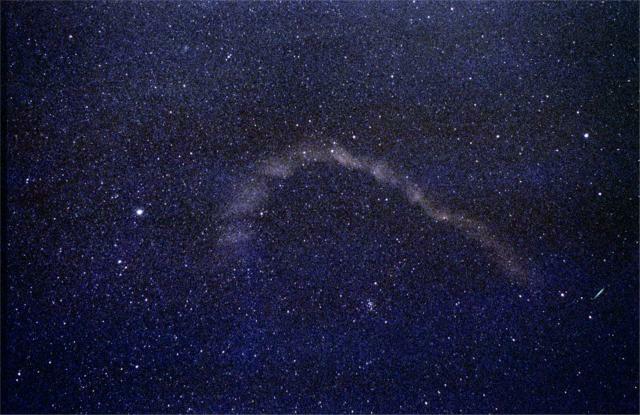 We watched an active appearance of Leonids, but we could not observe the shower like in 1966 or 1833. The peak of our observations was 18h-19h(UT) on Nov.17. But the peak was not sharp. We watched a long existent train of one fire ball which was appearant at 19h13m53s(UT). Following images were pictures of that train. 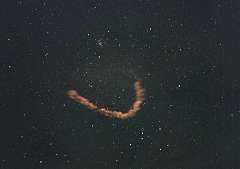 An interval of 5-15 seconds from one minute after the fire ball appearance. Clickable map of all continuous images. We recorded with I.I. and DVCAM video system. From 19h13m51s to 59s (7.3 sec.). From 19h13m48s to 15m18s (90 sec.). RealVideo ver. 5.0. 3. A picture from 4 minutes after the fire ball appearance. This picture is from 4 minutes after the fire ball appearance to 5 minutes after that time. The page of results of the 1998 Leonids by IMO(International Meteor Organization). Many results and images around the world.